Caption: The first power mower in the Missouri Botanical Garden. 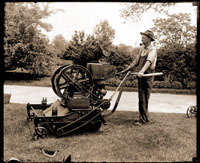 The mower was gasoline driven and water cooled. 1- 7x5 print.